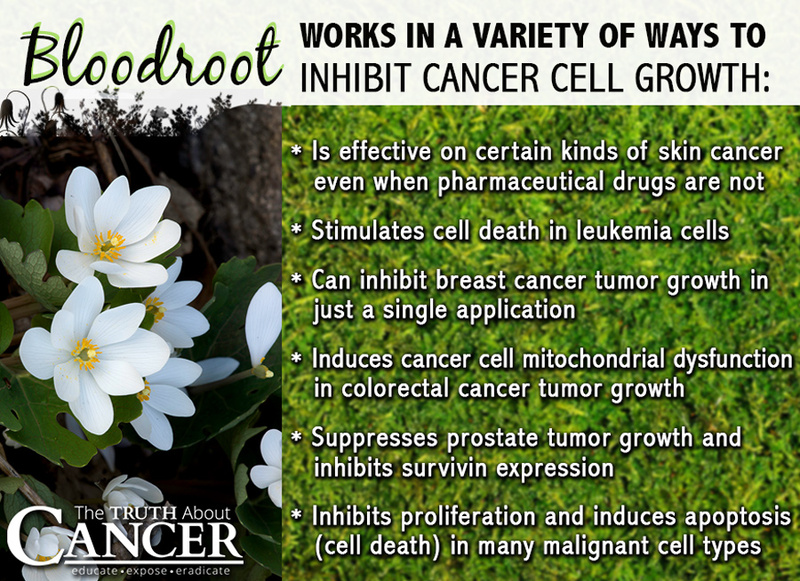 Home Health care cancer Bloodroot: An Ancient Remedy That Can Heal Cancer? Bloodroot is a humble plant that produces delicate white flowers in the spring and has also been a Native American cure-all for centuries. It is found mostly in the eastern part of the United States and can help with digestive problems, respiratory issues, and skin ailments such as skin tumors and warts. Recent research also points to the power of this unassuming plant’s root system as a source of the powerful alkaloid Sanguinarine, which has long been known as a cancer fighter. How Does Sanguinarine in Bloodroot Kill Cancer Cells? As researchers such as the ones above are discovering, Sanguinarine works in a variety of ways to inhibit cancer cell growth. Its one-two punch, however, is really felt in its ability to effect survivin, a protein that is specifically designed to inhibit cell death (apoptosis). When survivin is active in cancer cells, it can make them practically invincible. Sanguinarine directly inhibits the functions of survivin in cancer cells. This involves not only creating balance within the cell but also by directly breaking down the survivin protein itself. Without survivin working in their favor, cancer cells soon become subject to the normal cycles of cell death. One thing is for sure about Sanguinarine found in bloodroot − it appears that a little can go a long way. Because Sanguinarine is a benzophenanthrene alkaloid, bloodroot is usually used as a topical microbial for skin rashes and lesions. It is also used in toothpastes (it helps fight gingivitis) and mouthwashes, as well as for the conditions mentioned above. Although its cancer-killing effects occur when it is ingested, taking too much internally can lead to burning of the stomach, vomiting, vertigo, faintness, and dimness of eyesight. Because of this, never initiate your own at-home protocol with bloodroot. It should always be administered under the supervision of a qualified health care professional. Much has been written about the amazing healing properties of herbs that come from China, India, and other Asian countries. Not so much is known, however, about the powerful healing herbs that grow right here in the United States. Bloodroot, growing in the wild and as a decorative in many east coast communities, is just such a plant. Modern science is just now discovering what native peoples right here on this continent have known for centuries. As a carefully-used topical tonic, antimicrobial, and potential cancer-fighter, bloodroot can be a powerfully healing substance. Bloodroot is a humble plant that has also been a Native American cure-all for centuries. It can help with digestive problems, respiratory issues, and skin ailments such as skin tumors and warts. Recent research also points to the power of the plant’s root system as a source of the powerful alkaloid Sanguinarine, which has long been known as a cancer fighter. Researchers discovered that Sanguinarine, in a dose-dependent manner, is effective on certain kinds of skin cancer, even when pharmaceutical drugs are not. A University of Minnesota study also discovered that Sanguinarine had an effect on breast cancer cells after a single application. Never initiate your own at-home protocol with bloodroot. It should always be administered under the supervision of a qualified health care professional.